Christianity declares Jesus to be the Son of God. Muslims, in contrast, revere Jesus as a messenger of God, calling him Isa, but, like the Jews, view him as a human, not as a deity. Muslims further believe that Muhammad was a direct descendant of Abraham, without ascribing to him divinity. Over the centuries, countless writers have dealt with the complex relationship, diverse similarities and profound differences between these three faiths. We shall focus on one aspect of that story: The history of the faith whose impact on Saudi Arabia and Arabs has been paramount—Islam. Without understanding the rise of Islam, one cannot understand the history of Saudi Arabia or the history of the modern world. 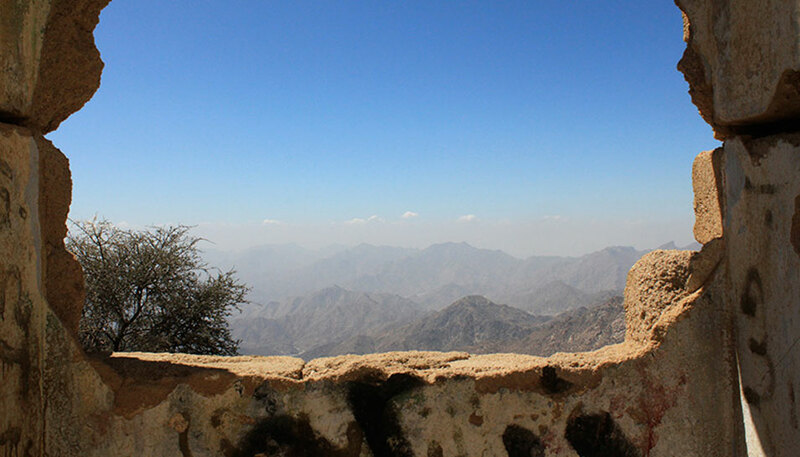 Located inland from the coast of the Red Sea halfway down the western length of the Arabian Peninsula, the holy city of Makkah sits in the Plain of Abraham, surrounded to the east, west and south by a rugged, mountainous landscape made up mostly of granite. In the center of Makkah stands the Kaaba, the holiest place of worship in Islam. Set within the cube-shaped Sacred Mosque, the Kaaba is a similarly cube-shaped stone built by the prophet Abraham. Nearby, at one of the mosque’s outside corners, rests the Black Stone, believed to be of meteoric origin. Both the Kaaba and the Black Stone were venerated by Arabs many centuries before the birth of Islam. At the dawn of the seventh century CE, Makkah was the most important political, commercial and religious center of Arabia. Muhammad ibn ’Abdullah was born in Makkah in 570 CE, a member of the powerful Quarysh tribe, the leading tribe in the city at the time. Orphaned by age 6, he was raised by an uncle. After working variously as a shepherd and a merchant, at age twenty-five he married a rich widow, Khadeejam, fifteen years his senior. Together they had six children, of whom only his daughter Fatima survived. Growing discontented with what he viewed as the degenerate, heathen character of life in Makkah, Muhammad retired into the nearby mountains. In those mountains, at age 40, in the month of Ramadan, he received the first in a series of revelations (“hadiths” [Arabic: الحديث‎]) from God, delivered by the angel Gabriel, revelations that continued until his death in 632. Surrounded at first by a group of forty or so dedicated companions (“Sahabahs” [Arabic: الصحابة‎]), three years later Muhammad began preaching publicly that there was but one true god to whom all men must submit, thereby launching a direct attack on the polytheism then practiced in Makkah. In 622, the threat of persecution by local authorities forced him to flee Makkah for Madinah, an event known as the Hejira, or Flight. That year marks the beginning of what is called the Muhammadan Era and serves as the first year of the Muslim calendar. Resettled in Madinah, Muhammad was recognized by believers as the prophet of God. Drawing to himself many followers, he led them on a series of conquests, culminating in the taking of Makkah in 630. Triumphant, he demolished the many pagan idols set up in the Kaaba to worship false gods and instituted the monotheistic religion we know today as Islam. At age sixty-three, in the eleventh year of the Hejira, Muhammad died from a violent fever and was succeeded by his father-in-law, Abu Bakr, one of the original forty companions. Abu Bakr was named the first Caliph, or leader. Previously, Abu Bakr’s daughter Aisha had become Muhammad’s second wife following the death of his first wife, Khadeejam. According to this legend, Muhammad was trying to prove a point to his followers by praying for the mountain to come to him. When it did not, he instead walked to the mountain himself, thanking God for His mercy—for, had Muhammad’s prayer been answered, he and everyone with him would have been crushed. The lesson to be learned was, Deal with the world as it is; do not expect it to conform to you. In modern times, Bacon’s words have been updated to say, “If the mountain won’t come to Muhammad, Muhammad must go to the mountain.” People commonly reverse the order and say instead, “If Muhammad won’t go to the mountain, the mountain must come to Muhammad.” Remember the next time you hear someone use this expression in either form that this tale is anecdotal, apocryphal, with no historical evidence to support it and no mention in the holy book of Islam, the Qur’an. 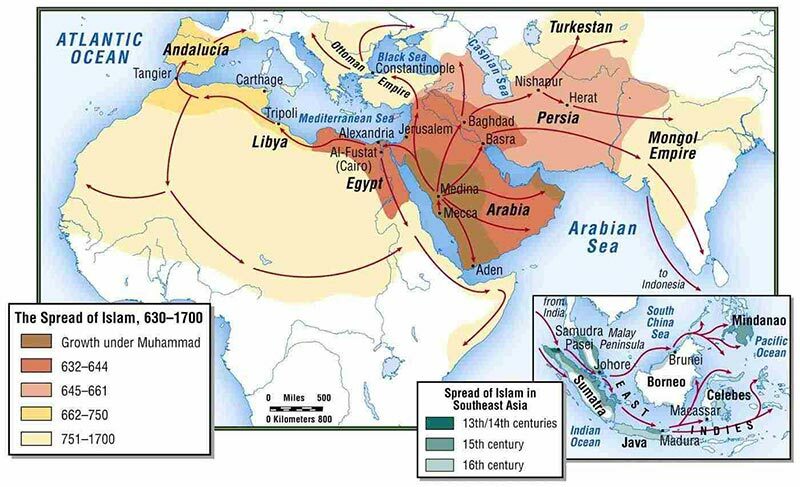 Over the twenty-seven months following Muhammad’s death in 632, under Abu Bakr’s leadership, Muslim forces continued the geographical expansion begun by Muhammad, invading territories held by the Persian Sassanid Empire and the Byzantine East Roman Empire. These two empires had recently been locked in a seemingly endless, mutually-debilitating war which left them vulnerable to the armies of Islam. Immediately preceding that war, a pandemic outbreak known as the Justinian Plague devastated both their populations, wreaking havoc on their economies and severely weakening them on the eve of the moment when they needed to be at their greatest strength. Abu Bakr was the first of four Caliphs (Arabic: خليفة‎) known as the “Rightly-Guided Caliphs.” He was followed in that position after his death in August 634 first by Umar, then by Uthman ibn al-Affan and then by Ali ibn Abi Talib. His three successors continued the wars of expansion into Persian and Byzantine territory first launched by Abu Bakr. In 636, Muslims forces under Umar conquered Syria. The next year, they took Persia and Jerusalem and, five years later, Alexandria in Egypt, all under Umar’s leadership. Up till then, the political and religious center of Islam had remained in Madinah and Makkah. By 661, however, the political center of Islam was transferred under the Omayyad caliphs to Damascus. From there, the caliphs directed their armies on continued conquests westward along the coast of North Africa and finally across the Straits of Gibraltar to Spain. In time, most of the Byzantine Empire and the entirety of the Sassanid Empire came under Muslim rule. The Muslim advance into Western Europe was stopped only in October 732 when Frankish forces led by Charles (“The Hammer”) Martel defeated them at the Battle of Tours (also known on the French side as the Battle of Poitiers and on the Muslim side as “ma'arakat Balâţ ash-Shuhadâ” [Arabic: بلاط الشهداء‎ ; English, the “Battle of Court of the Martyrs ”]) in north-central France—considered by many historians to be one of the great turning points in history. Supporters of that view speculate that, had the forces of Islam continued their advance into the European heartland, the subsequent history of Europe and the world at large would have been much different from that which ensued. 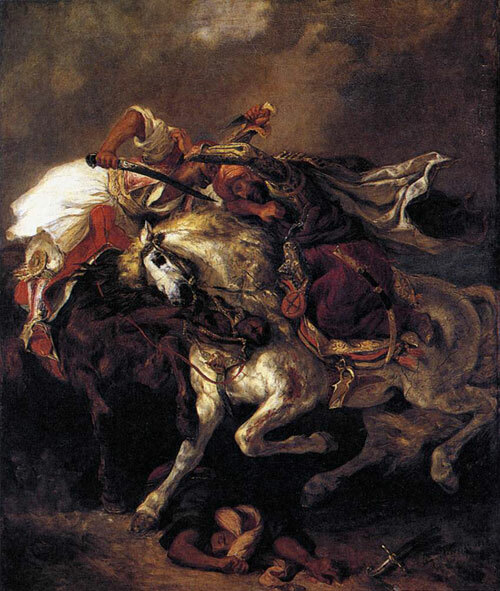 The defeat at Tours came 100 years after the death of Muhammad. For fully a century, the forces of Islam had been invincible.